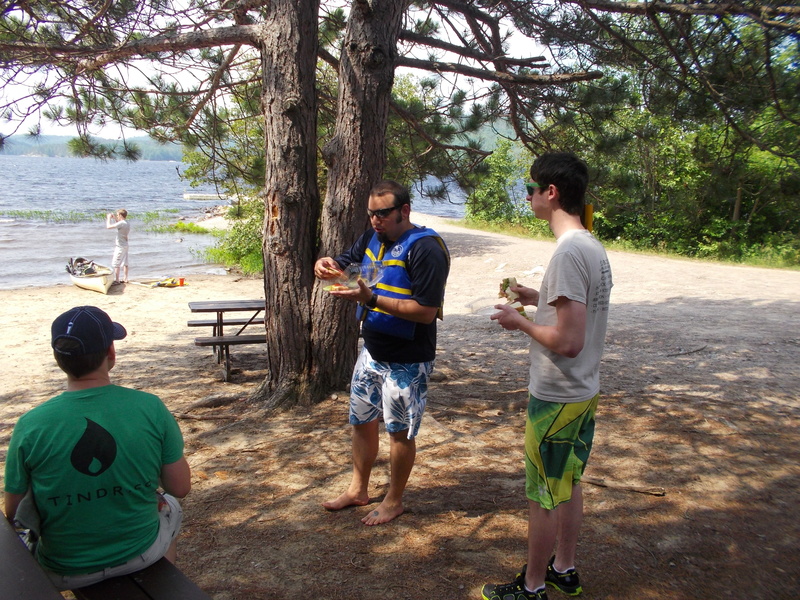 This past weekend, I led the Tindr team on our second annual Algonquin Park camping trip. The trip was exactly the same route as we planned last year. Of course last year, our entry point was shut down due to a forest fire and we had to do a different trip full of mosquitoes, leeches, heavy canoes, death marches and fire bans. But that’s a different story. This year, we were determined to do our planned route. I get the feeling that the weather had other ideas for us though. We made a beeline for the park from Ottawa, leaving at 7:30am and going non-stop to the gate (minus a few Google Maps misdirections). Originally we had planned to get in early so that we could get some of the better sites on the lake. As it turned out, we would not have been able to do our trip if we had arrived any later. Arriving at Achray on Grand Lake, we started to unload cars and get canoes together with a brief interlude to scarf down some delicious Piggy Market sandwiches. The wind was blowing hard enough to get some serious whitecaps going across the lake. I have to admit that I was a little nervous, leading a team of strong but largely inexperienced canoeists, that we wouldn’t be able to make it across. It was a relatively short paddle to the little river into Stratton Lake however, so I figured that we would be able to muddle through. As we packed up the canoes, the park warden wandered over and casually mentioned to us that there was a “tornado watch” on the forecast. He was pretty calm about it and specifically mentioned that it was “just a watch and not a warning” so we shouldn’t be too worried. We really didn’t think too much of it at the time. 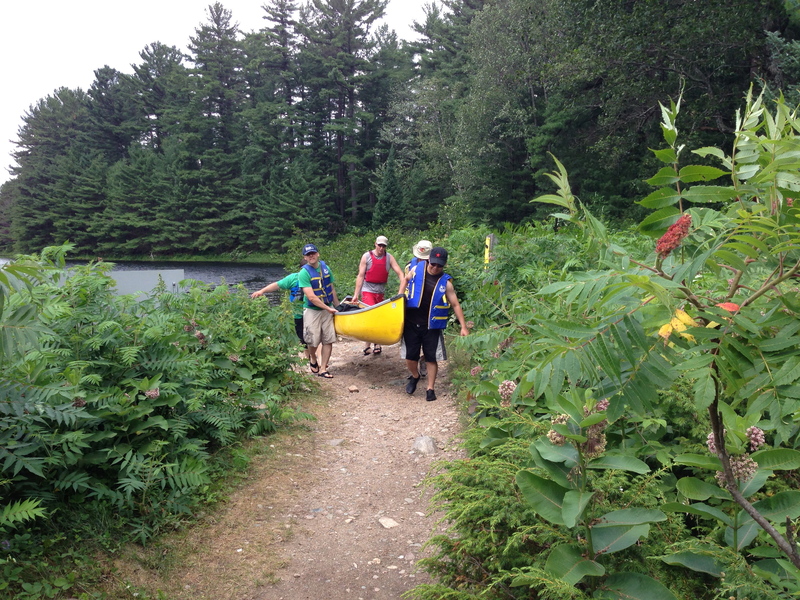 After a hard paddle and a fair amount of coordination, we made our way out of the wind and on to the little river. We handled the short lift-over quickly and efficiently – my team never fails to impress me. It wasn’t until we made our way into Stratton that things got really hairy. As we passed under the railway bridge that marks the start of Stratton Lake, Long looked back up in the sky and motioned for us to have a look. The blue sky above us, punctuated by the occasional fluffy cloud, was being rapidly overtaken by a dark menacing line of grey cloud – like a blanket being pulled over the sky. 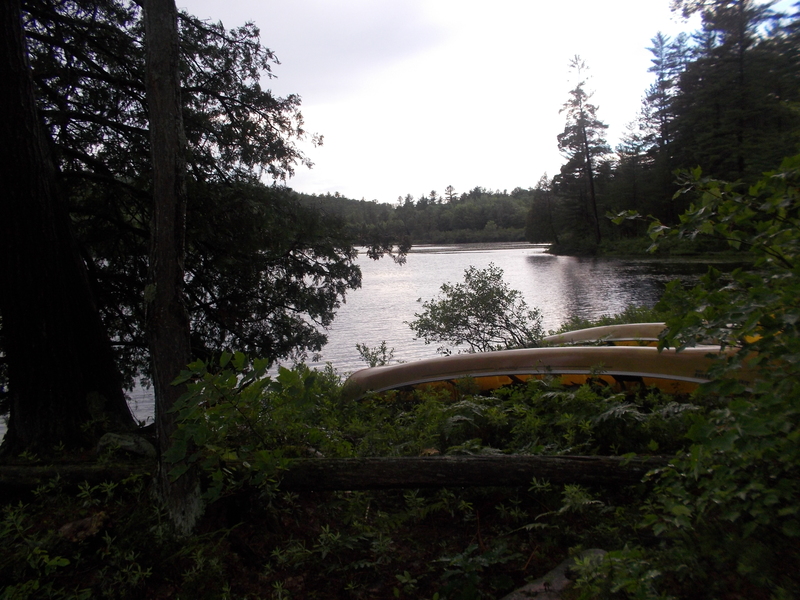 I yelled out to the other canoes to get close to the left shore “just in case”. Everyone quickly complied and we took up the rear on the race over to the bank. As we were about halfway across the water, the rain started up. It was the strangest weather event I’ve ever experienced. Rain was everywhere in the sky, but none of it seemed to be hitting us. There were impacts from the rain all around us, but we seemed not to be getting wet at all. Additionally, there were circular ripples being carved out on the otherwise relatively calm surface of the water. Suddenly, there was a sound in the forest beside us. It sounded like a waterfall had just spontaneously started. We looked over to see trees being snapped like matchsticks and falling over. It was like a monster was coming through the woods towards us. Andre yelled “That’s a ***ing tornado!”. We put on the afterburners and made our way quickly to the far shore, pulling the boats up and getting ourselves away from the water. Just as the roaring beast appeared to be able to exit the woods and to come across the water at us, it dissipated, leaving us, hearts pounding, in a drenching rain. Thunder and lightning quickly replaced the funnel that had just missed us, keeping us pinned on the shoreline. As the lightning flashed, we counted out the seconds between it and the resulting thunderclap. Lightning struck so close that the ground we were standing on shook. I jumped about a foot in the air and didn’t stop shaking for a good 20 minutes after. After the near miss, the storm grumbled its way further and further away and we got back underway to our campsite. 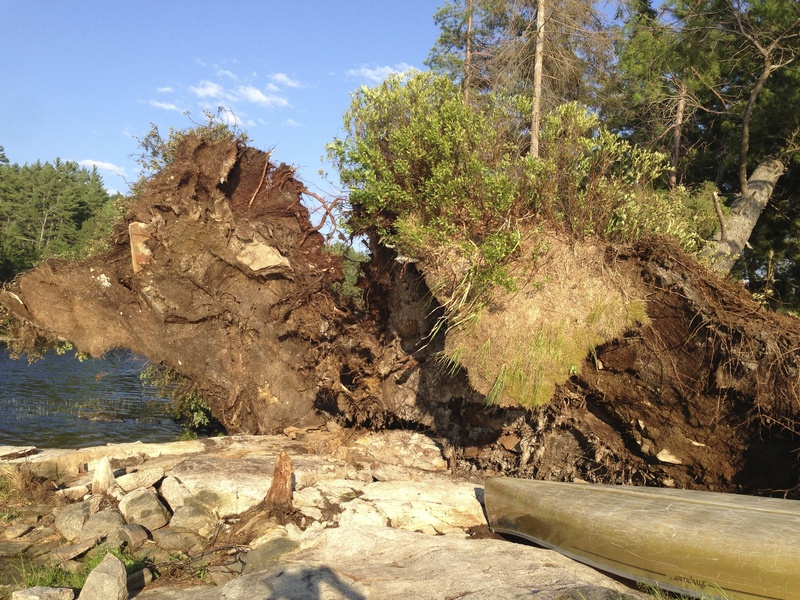 In the next couple of days, we saw tons of large trees downed across portage trails and campsites. We also learned that the road had been closed by the tornado shortly after our departure and had not re-opened until later that night once they had managed to clear away all the trees. All in all, the rest of the trip was amazing, filled with sunshine, no bugs (due to the high winds), swimming, water slides at high falls, blueberries and amazing scenery along the Barron River. But what stuck with me, after the most violent weather event I’ve personally ever experienced is that this is the reason to get out in the woods. To have the experience of facing something completely uncontrollable, completely different from our technologically enabled lives, being forced to adapt and eventually thriving in the face of it. The actual gravity of the storm hit me when I saw the trees that were snapped right in half! (can you put up a pic of one of those as well?) Overturned trees from the roots kind of make sense when you see how rocky the soil is causing the roots to grow shallow, but those trees that snapped in two just by the sheer force of the winds… Nature doesn’t mess around! Another day in the exciting life of Mike Kelland! Glad you and the team made it out safely. Thank you for sharing your experience of the trip. I’ve camped out many times and never experienced a tornado – so this was quite unique. A very well organized trip and really helpful and high spirited team – cant ask for much more! Mike Kelland.com © 2019. All Rights Reserved.